First off, what is Datapop? Jason Lehmbeck: Datapop was founded by myself and John Zimmerman. We are ex-Overture and Yahoo! Search executives, to solve a big problem in the marketplace. Lots of marketers are feeling a lot of pain in their search marketing, and we thought there was a great opportunity here to solve that problem. The problem that marketers have, is they have unprecedented ways to get to the right consumers through search, but have no tools, frankly, to serve up an engaging ad in that environment. We started the company with the goal of making every search ad relevant. What our technology platform does, is determines what about a marketer's offers that will matter to the consumer. That's based on insights into the customer and product, so that we can build relevant, optimized, geotargeted, and customized ads that will engage consumers. That allows marketers to drive a significant increase in sales, and a reduction in cost on the back end. There are lots of search marketing technology companies out there--what have you added to mix which is new? Jason Lehmbeck: There are two core pieces to the technology. On one side, we're able to take what a marketer is offering, whether that is a product or service, and semantically understand what part of that offer or service will resonate with consumers. For example, take a product from a major electronics retailer, a 42-inch flat screen TV. We have technology which automatically determines that screen size is something of importance to consumers, that resolutions is important, and how people are searching for the product--in this case, a TV. We distill the core elements of that, and come up with synonyms and misspellings that are being used to search for those products. That's one side of the equation, understanding what it is about a marketer's offer that will resonate with consumers. The second part, is we auto generate target keywords and geographic targets, and connect those to highly specific ads, which are based around the data aggregated around that marketer's offer. That means, you go from having a couple of generic ads across millions of keywords, to millions of ads around those keywords, which are very specific to what consumers are looking for and the intent of their search. That is ultimately what will draw them in, and ultimately convert those consumers. What's your background and that of your co-founder? 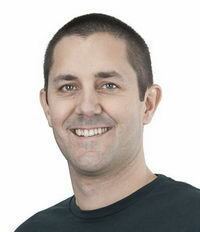 Jason Lehmbeck: The core crew here has been innovating in search for the last five years. We were at Overture Services here in Pasadena, and ultimately worked at Yahoo. The core team has been doing innovative things on the platform side. John Zimmerman, my cofounder, created the commercial API for Overture and Yahoo Search. He had been helping technology providers scale on top of that search platform. My background was in taking new innovative solutions to market, including Smart Ads, which I worked with engineering in Yahoo to adopt, test, and scale across our platform, at both Overture and Yahoo. Talk a bit about your funding round? Jason Lehmbeck: We raised $1.7M from a couple of great partners. We were focused on working with venture capitalists who had the same approach and same business philosophy to scaling the business, and we wanted to work with partners with a deep domain expertise in online advertising and data. Rincon Ventures is our lead investor, with John Andelman and John Greathouse. They're a local team out of Santa Barbara. IA Ventures is a New York firm that has a deep domain expertise in big data. And, we also have Momentum Ventures here in Los Angeles, and some strategic angels, including Accelerated Ventures in Silicon Valley. What are you using that new funding for? Jason Lehmbeck: The main use is to hire and build on top of our top notch engineering crew. We want to scale out our platforms to meet marketer demand, and build our platform to scale. How far are you from getting to market? Jason Lehmbeck: Fortunately, give our background working with new advertising technology at Overture and Yahoo, we have a deep rolodex in the marketing space. Our focus is on travel, retail and local advertisers. Since launching, we've been able to get a leading retailer--one of the top five retailers in the nation--onto the platform, with full engagement. We also have a couple of leading comparison shopping engines and advertisers. So, we're live with several marketers and paying customers, who are seeing a 30 percent increase in sales on average, and a 15 percent decrease in costs. We've got a great set of customers we're working with, who are sophisticated search marketers, who have given us deep feedback on how to build and scale the platform. Thse are customers that spend a lot on search, and we're enabling significant performance upside for them. We've got the momentum going on customer adoption. Finally, what kind of marketers most benefit from what you have to offer? Jason Lehmbeck: The common denominator is they have a very rich set of offers. In retail, they tend to be marketers with thousand of product SKUs or more. In travel, they don't necessarily have to have lots of services, and have thousands of hotels--they could just have tens of hotels and cruise lines--because of how their inventory works, and because prices are changing intraday. We can help them get that real-time pricing into search results. The size of the company doesn't matter--it's just if they have a rich set of offers that will resonate with end customers. We have marketers that range from medium sized spenders on Google, Microsoft, and Yahoo, to those that are spending millions per month on search ads.